Jurors in the trial of 21 year old Dzhokhar Tsarnaev are hoping to return a verdict on Wednesday, following weeks of testimony in the Boston Marathon bombing trial. Tsarnaev faces either life in prison or the death penalty. 5. Was older brother Tamerlan working as an informant for the FBI? Ever since the two Tsarnaev brothers were announced by the FBI as their “prime suspects” in the Boston Marathon Bombing, every major US media network and government agency assumed that they were guilty – based solely a single photograph and a series of still photos created to look like CCTV footage, purporting to place them at the scene of the main event. Despite a wall of denial and evasion, some smarter elements of the media discovered that not only did the FBI know who BOTH brothers were, but elder brother Tamerlan (photo above) had already been recruited by the agency as an informant years before the Boston Bombing (his file is likely classified, meaning the public will not allowed to know the whole story), and although he is not live to tell his side of the story – he was most likely working for either the FBI or another agency in that capacity. This explains why Tamerlan traveled overseas in the summer of 2012 to attend the American Committee for Peace in the Caucasus – an event that was organized by the Jamestown Foundation – a well-known CIA front, which is part of a vast network “controlled by Freedom House (George Soros) and linked to the CIA”, as explained in detail by Voltaire Network. Former British diplomat and intelligence analyst Craig Murray has also weighed-in with a similar conclusion. One year ago, defense attorneys for Dzhokhar Tsarnaev spoke about how the FBI attempted to recruit his older brother Tamerlan to spy on Muslims and the Chechen community in the city, which began prompting some journalists in the US to ask how well the FBI knew the Tsarnaevs and whether or not the FBI could have prevented the bombings taking place. Something happened between now and then whereby the defense appears to have completely ‘thrown in the towel’, as it wear. Federal District Court Judge George O’Toole intervened early on to limit testimony showing any connection that Tamerlan manipulated Dzhokhar into participating in the ‘bomb plot’. Oddly, the defense team, led by Judy Clarke, were quick to proclaim their client’s guilt and did not cross-examine any victims, and only called four witnesses – before resting their case. It’s as if they wanted this to be over with as quickly as possible. According to the Huff Post, “Securing a life sentence for Dzhokhar Tsarnaev [and not maintaining any innocence] has been seen as the defense team’s overriding goal.” Killing two birds with one stone, Clarke also threw Dzhokhar’s dead brother Tamerlan under the bus in order to reinforce the official narrative. “We don’t deny that Dzhokhar fully participated in the events, but if it were not for Tamerlan, it would not have happened,” said Clarke during closing arguments. Unfortunately for him, Tamerlan was never afforded any due process – and in the eyes of Judy Clarke and the federal prosecution – was always assumed guilty. The FBI knew who Tamerlan was long before the said crime took place. This fact alone should cast doubt upon the entire official narrative of the events on April 15, 2013. 4. Why were Craft International mercenaries active at the finish line, and did one of them place a backpack on the ground just before the bomb went off? Taking these facts into account, along with multiple live terror drills that were taking place that same day along the Boston Marathon, jurors may have drawn a completely different conclusion to the prepackaged narrative which was presented to them by both the prosecution and the defense. 3. Why were Boston Police previously in hot pursuit of two completely different named suspects before the Tsarnaevs were named, and why are they both dead? The most disturbing fact in the FBI’s ‘Tsarnaev Brothers’ storyline, is that hours before the fugitive brothers’ photos were thrust into the national spotlight by the FBI, two other suspects were being pursued on April 18th, and may have been killed following that multiple manhunt. The first two names which were announced as suspects by the police were Mike Mulugeta, reportedly as shot dead, and the other suspect was that missing 22 year old Brown University student named Sunil Tripathi. 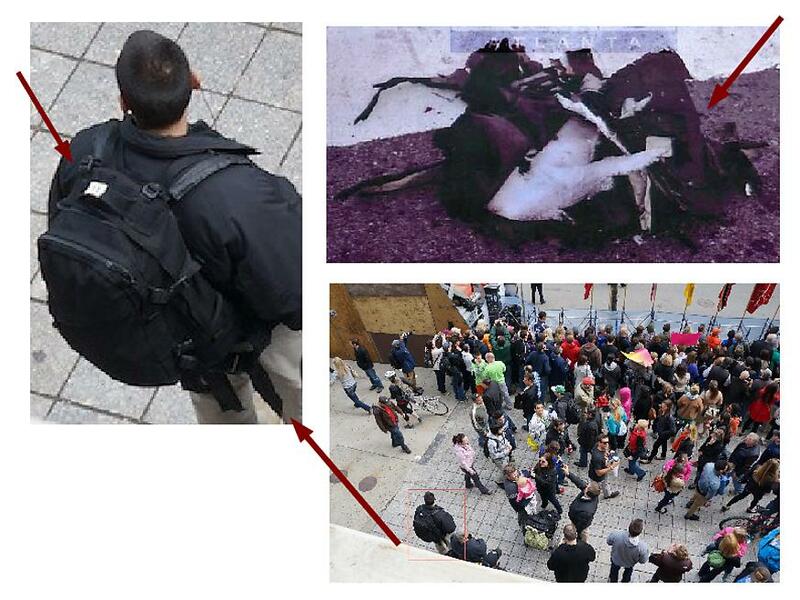 Similar looking: Dzhokhar Tsarnaev and Sunil Tripathi. This was also confirmed by CBS local: “Boston police on Friday revealed the names of two suspects in the Boston Marathon bombing, one of whom is an Indian origin person, Sunil Tripathi, reported CBS-affiliated television station WFSB.” Previously, Tripathi was reported missing and even appeared on an official FBI Missing Persons List from March 16th, which coincidentally followed a series of bomb explosions between Providence, RI and Boston – taking place approximately one month earlier on March 12th. Mike Mulageta and Sunil Tripathi were the first to be named by the police as suspects in the Boston Bombing, and both were killed. 2. Was Tamerlan Tsarnaev alive while in police custody? She is describing how she saw the first suspect, Tamerlan, was run over by a police SUV and then mortally wounded by multiple police gun shots, after which time the police began their incredible manhunt for the second suspect Dzhokhar. She ends the interview by stating how the police had ordered her to stay inside, or ‘shelter in place’ for the remainder of the evening. To date, some ‘debunking’ websites have tried to discredit these pieces of evidence, but none have been able to explain away the clear forensic merits of both. 1. Dzhokhar exited the boat uninjured, yet, he was hospitalized later with a ‘throat injury’. How could he have penned such a perfect confession whilst hiding under a boat tarp in the middle of a fire fight? Still image from helicopter footage of Dzhokhar. 21WIRE has demonstrated how our original analysis of the apprehension of Dzhokhar Tsarnaev was indeed correct – that a police firing squad had tried to murder the unarmed suspect when he was discovered hiding under a tarp in a boat. The FBI, however, declined to discuss what prompted the mass gunfire by police. Moreover, Boston Police have yet to explained how Dzhokhar’s throat became so badly lacerated as to end up in serious condition, hospitalized at Beth Israel Deaconess Medical Center, and left unable to speak for many weeks afterwards. Helicopter footage from the arrest appears to show the suspect climbing out from under a tarp in very good form, even though police insist he was bleeding all day from “gun shot wounds” sustained during his escape. These are only a few of the serious questions and obvious anomalies surrounding the Boston Marathon case, yet none of these were ever addressed, or included by either the defense of the prosecution in court – leading 21WIRE to conclude that the trial of Dzhokhar Tsarnaev was a classic ‘show trial’ – one which was never intended to discover anything which wasn’t already prearranged or choreographed in advance. With that in mind, and with a federal ‘Weapon of Mass Destruction‘ case stacked against him, it’s certain that Dzhokhar would have done or said anything – in order to avoid the death penalty.